there are more of them. I have pictures of a room that was stencilled in murky pinks and greys with the same stencils of roses. I can not locate the photos but try to imagine it, the quiet colour palette looks very pretty with these designs. Our 298-Rose Garland design could make a door decoration to look as lovely as the one at Anya's shop and we make monogram stencils too. If you wanted to decorate to the same overblown scale as the windows at Anya Hindmarch remember that we make each stencil to order so they can be scaled up or down in size for you....within reason. this is just one of the many things that it can do. It looks pretty handsome on floors and fabric too. If you don't use the guidelines on the stencil to make a repeating pattern you can stencil the motif then flip the stencil over and create an opposite image. This technique looks great on pairs of cupboard fronts and cushions. This wall was decorated as a tribute to Florence Broadhurst, who amongst other things was an Australian singer, actor and wallpaper designer known for bold oversized natural subjects, often on metallic backgrounds. Her murder in 1977 remains a mystery. The wall was painted with gold emulsion paint. At the time of decoration, we were fond of Crown Paint's 'Millionaire'. So, that might have been the brand and colour. The dark blue violet was the same colour as the ceiling and 'pale portrait pink' acrylic was used on the bamboo. To find the JA51 stencil and the acrylic paint follow the links. For the less adventurous the bamboo stencil looks good in shades of brown over gold! VN7 Chain Lightning stencil, worth another look. I never tire of seeing our VN7 Chain Lightning stencil. I enjoy seeing our customer's pictures of their finished projects with it. The stencil has appeared in a film set, some rather famous people have purchased it and it is one of our more popular pins on Pinterest. Rachel E stencilled it in the lounge of her Art Deco home, we featured it on our blog in 2014 and people all over the world seemed to love it! I felt that it was worth another showing off. The film set designers and one of the famous people chose to stencil it in the same colours that Rachel had used; which were Sunset Gold from The Stencil Library stencilled onto a blue/black wall covered with a Farrow & Ball paint, it looks gorgeous in pale colours too. Today a Sunset Gold and a VN7 Chain Lightning stencil left our packaging desk for a new home overseas. 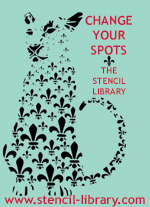 The stencilling can be applied with a foam roller or a large stencil brush. VN7 is a tough stencil and you can get a lot of wall space decorated with it. It is a good choice for ceilings too because the design is robust and there are no floppy bits! Bon voyage, Chain Lightning. I hope that you and your new owner create fabulous finishes. Chinese New Year; Year of The Pig, stencilled of course. Happy Chinese New Year, it's the year of the pig and 'Poppa's got a brand new pig bag'. You can make your own, perky, porcine themed apparel with our 'Pigs Might Fly' stencil and some metallic paint. I just love the gleeful expression on their faces! The bag was stencilled by me, available from For Queen and Corgi. We have designed a companion for one of our favourite stencils, the 'Y10 Three Swallows' The Y10 stencil features a swallow motif in different sizes. They can be stencilled as a swarm, in a row or as single motifs. Stencil Y-10 is versatile and inexpensive. Now, meet the new kid on the flock. The new stencil helps those that have less time or confidence to create a swarm or 'flight' of stencilled swallows. The beginning of the flight has been created for you on stencil layer 1. The direction of flight depends on which side of the stencil you wish to use. Creating a stencilled flock, swarm or flight is a handy solution when wonky ceilings, odd placements of doors, niches, windows and other obstacles prevent a more formal style of decoration. The flight could provide an alternative to directional signage, eg. 'Follow the Swallow' whereby a trail of stencilled swallows leads to an exit, or the washrooms or garden. I have stencilled a long skirt with the swallow flight too, I was told it was 'Just the right side of creepy' which actually was meant as a compliment. All the small swallows (stencil 1) are applied first. When you are happy with the flow of the 'flight' start to stencil the medium-sized swallows over them (stencil 2). You do not need as many of these as you did with layer one. Finish with a few motifs from layer 3 The three sizes of swallows gives a sense of perspective to the decoration. Here are a couple more examples of decoration from our various stencils of swallows. The new 'Flight of Swallows' stencil is available by contacting us, it is not on our website. I will put details of the new stencil in the comments section below. Links to other swallow stencils are VN300 and Y-10.